Million Dollar Challenge Scam Review - Stay Away! Million Dollar Challenge Scam Review – Stay Away! Million Dollar Challenge by William Stanford invites you to make easy money with him, but stay away – because Million Dollar Challenge is a scam! We’ve investigated the scam thoroughly, so make sure you read the full Million Dollar Challenge review before you plunge into an obvious trap. How long has Million Dollar Challenge really been around? As soon as you enter the homepage of Million Dollar Challenge, you’ll be presented with an attractive headline and an auto-play sales video. I’ve accessed the website from Singapore, so the headline reads “Available Now In Singapore Get Access to My $1300 Daily Income Software FREE”. If you access it in any other country, it will change the headline to suit your location. It’s done through a simple geo-location computer script. Note how the headline is targeted at internet population who wants to get rich quick, and without financial commitment. Is Million Dollar Challenge really FREE? Or will it generate any money for you? As you will find out in the rest of this review, none of the claims are real. The headline is just a marketing tactic used to attract your attention and to make you watch the sales video, where they try to brainwash you into signing up. Notice how the alleged owner of Million Dollar Challenge scam, William Stanford claims that there have been members who used the software for at least 8 months. In the FAQ, they went as far as to say that the software has been around for almost 2 decades. This review was written on 14th May 2016, so we decided to find out if the software has been around since years ago to authenticate his claims. We consulted the whois information for million-dollar-challenge.co, which contains the creation date of the website. 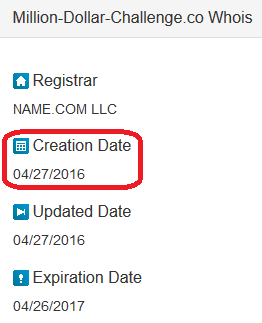 As you can see from the screenshot, the website was only created on 27th April 2016. Keep in mind that Million Dollar Challenge software can only be obtained through the website itself, by registering using the form provided. This is due to the fact that Million Dollar Challenge software is tied to the broker they assign for you. In other words, you cannot get the software from anywhere else, other than to sign up through million-dollar-challenge.co. However, William Stanford claims that there have been people who used the software long before it went live! How is this possible? Apparently, William was lying in the sales video, because he wants to give you a false impression that the software has been around and profiting for a long time. The members featured in Million Dollar Challenge are fake. Several members were featured in the sales video, in which William Stanford claims to have made huge profits with his software. Let’s take a look at Henry Gallon, the member featured in the screenshot above. William claims that this man made $104,000 in just short 3 months. We did a reverse lookup of this member, and found the origin of the photo. As you can see, this is a royalty free photo (or stock photo), where anyone can use in their website without consequences. In other words, Henry Gallon does not exist. He is just a fabricated member used by Million Dollar Challenge scam to promote the software. It goes without saying that the profits quoted by William Stanford is fake, too. 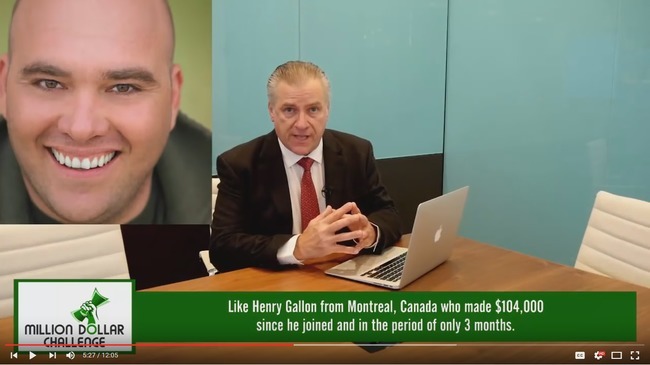 To quell the curiosity of our more skeptical members, we decided to exposed another fake member featured in the sales video of Million Dollar Challenge. This lady, Carly Hamilton is said to be from Sydney, Australia and managed $187,000 in just 6 months of using the software. 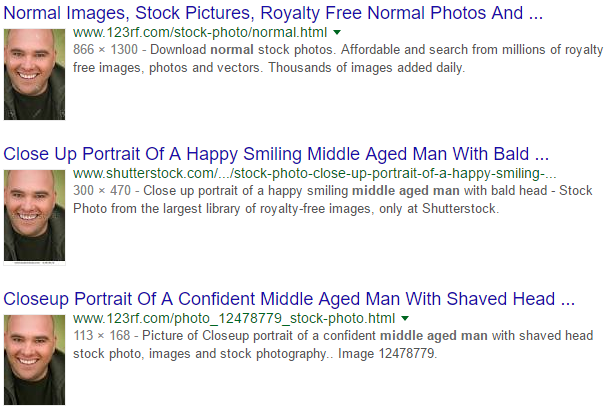 Similarly, we found the same photo taken from various stock photo websites. Why didn’t they use testimonials and real photos of satisfied users? The truth is, there is no satisfied users. Million Dollar Challenge scam doesn’t work, and all is does it to eat away your deposit and give nothing back. Once you sign up for the software and fund your account, your money will be lost in a quick succession of losing trades. In the end, Million Dollar Challenge scam will be the only beneficiary who profits from your deposits. The truths of Million Dollar Challenge scam are hidden in the disclaimer. Even though William Stanford repeatedly promised that you’ll make big money with his software, he seems to have some dirty secrets hidden in the disclaimer, after all. You won’t find this document anywhere in the sales material, because it’s supposed to be hidden from you. The only place you can access it is through a very small fine print that reads “disclaimer”, hidden at the bottom of the sales page. 99% of victims won’t even realize it’s there. Due to the high risk nature of trading, ‘Million Dollar Challenge” explicitly does not make any express or implied warranties or guarantees that user will make any profit or that user will not lose any or all deposited investment funds. Self explanatory – Contrary to what they promise in the sales materials, Million Dollar Challenge scam does not guarantee you any profit. Not only that, you will most likely end up losing ALL your deposited investment funds. 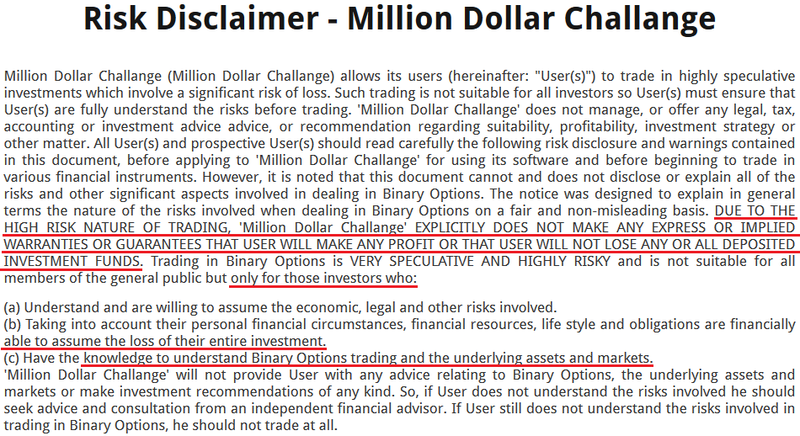 Again, Million Dollar Challenge scam admits that trading binary options is extremely risky, and it is only for investors who can stomach the loss of their entire investments. If William Stanford really wants to be truthful, he would’ve told you about the risk of using this software. But then again, you wouldn’t have signed up for the blatant scam if he did. Is Million Dollar Challenge a Scam? YES, MILLION DOLLAR CHALLENGE IS A SCAM. We strongly advise you to stay away from the scam if you don’t want to lose your hard-earned money. GPS Trader Review – GPS Trader is a Scam! Million Dollar Duplicator Review – It’s a Scam!